Methods to access resources if you're not on the campus network. Almost all purchased resources are accessible remotely and use IP authentication. You must be a student, faculty or staff affilated with the OUHSC and be on the campus network to gain access to resources. If you are not on the campus network you will be prompted by the proxy server to login using your OUHSC credentials; this is necessary only once during a brower session and occurs the first time you access a restricted resource. This makes you appear as though you're on the campus network when you're at remote location. If you are connected to the campus network using the VPN (Juno Pulse) you won't be prompted by the proxy. If your account is locked contact Information Technology at servicedesk@ouhsc.edu or 405-271-2203, or 888-435-7486. If using a bookmark or a link from another web source, try using the link from the Library home page. If you're in a hospital on campus, you will not have access to the proxy. If at OUMC there should be a link in the banner to OUHSC resources, use it to gain access to resources. Try clearing your cookies and temporary files (cache). Try another browser to make sure it's not the browser you're using. 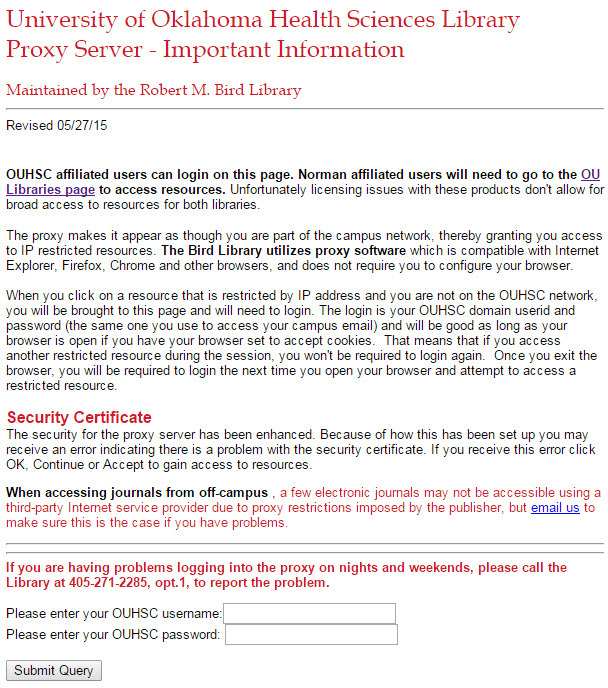 For other access issues contact the Library at bird-reference@ouhsc.edu or 405-271-2285. HAVING PROBLEMS WITH A SPECIFIC RESOURCE? There are only a handful of resources that aren't authenticated using IP or don't allow remote access. The most popular resource that falls in this category is UpToDate, which is not licensed for remote access. If it appears there's an issue with a resource, please notify library staff using the Ask a Librarian form or call 405-271-2285, opt.2.